It All Makes Sense Now. Sorta. I like a great many things about this world. Yummy snack foods, the beauty of nature, the serenity of the cosmos. There is so much to love that I wonder how anybody finds time to hate anything in this great green planet of ours. Yet, by my own admission, I detest something very, very much, to the point that when the topic comes up for discussion, my lovely wife hides the children lest they be witness to heated words and newly-minted profanities. This is not some "Oh, I really hate brussell sprouts" dislike. This is a deep, visceral, emotional, primal hatred, akin to "I hate getting kneed in the groin." It wasn't always such. When I was a kid, I actually loved America's Team, with Roger Staubach, Danny White, Tony Dorsett, and Tom Landry. Even though the Buffalo Bills were my favorite team (my first pair of pajamas was a "#32 The Juice Is Loose" set of OJ Simpsons, complete with footies), I still loved to watch the Cowboys. The glitz, the glam, the success, it all appealed to a young lad freezing away his youth in Western New York. Jones bought the Cowboys, fired Landry, and hired Jimmy Johnson, who apparently knew every crack-smoking thug of a football player in the country and invited them all to Dallas. (What do you call a drug ring in Dallas? A huddle.) I started to sour on the Boys, which was accelerated by back-to-back thumpings of the Bills in the Super Bowl (What do the Buffalo Bills and marijuana have in common? They both get smoked in bowls by the Cowboys) until finally, I arrived where I sit today, hating the Cowboys. The one source of joy that I have been granted the past decade has been Dallas's utter futility late in the season and in the playoffs. Even though the Boys are picked every season to win the Super Bowl, and even though every Dallas fan I know acts as if they actually did win the Super Bowl every year, the Cowboys choke year in and year out. They haven't won a playoff game since 1997. In fact, the Arizona Cardinals have won more playoff games in Dallas (one) than Dallas has in that long span, and is 4-2 in the playoffs over that time. I like to remind my Dallas fan friends that a college student entering his sophomore year would have been in kindergarten the last time Dallas won in the post season. When his team made the playoffs after the 2007 season, Romo began preparing for the playoffs the way that any professional would - he flew to Mexico with his girlfriend, Jessica Simpson. While his teammates were studying film and developing game plans, their leader was canoodling on the beach with the woman who wanted to know if Chicken of the Sea was poultry or seafood. Undeterred by all the criticism he received from fans and media, Romo led his team to a home loss to the Giants, which was iced by a Romo interception in the end zone with less than 30 seconds to go. 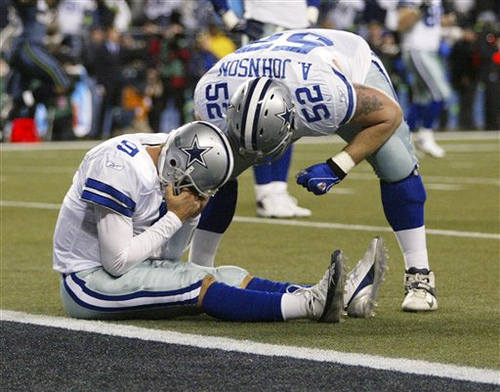 The 2008 season started out well enough, with Dallas winning their first three games. But as the season wore on, the Boys struggled and were faced with having to win their last game at home against division-rival Philadelphia to secure a playoff spot. When the last day of the season rolled around, the Cowboys didn't even bother showing up and lost 44-6 (If you call Tony Romo, why won't he answer? He can't find a receiver). The Germans invented the word schadenfreude to describe what I feel about Tony Romo and the Dallas Cowboys (It means "taking delight in the misfortune of others"). See, after Tony dumped Jessica, she sought out a witch, who put a hex on Romo. I don't know what the exact incantation was, but it was probably "Double Bubble red and pinko, make the Dallas Cowboys stinko." I should know because that's the one I've been saying each week during football season and it has been working so far. Right on Fat Kid!!! I couldn't have stated it better myself. This page contains a single entry by Louis Core published on August 25, 2009 10:20 AM. Our Glorious Leader Has Passed was the previous entry in this blog. Ahead, Warp 0.000003. Make It So. is the next entry in this blog.